AP Yuva Nestham Apply Online Registration: Andhra Pradesh Mukhyamantri Yuva nestham /Nirudyoga Bruthi /Unemployment Allowance scheme 2019 online Registration Process has been started. Eligible candidates can apply online for AP Yuva nestham Scheme at official website yuvanestham.ap.gov.in. The Government of Andhra Pradesh has introduced the AP Yuva nestham/Unemployment Allowance scheme named ‘Mukhyamantri Yuvanestham (ముఖ్యమంత్రి యువ నేస్తం)’. To support and mitigate hardship faced by educated unemployed youth in the state our Chief Minister Sri Nara Chandrababu Naidu garu started this scheme. The Government of Andhra Pradesh has introduced the AP Nirudyoga Bhruti scheme / Unemployment Allowance scheme 2019 for the educated and unemployed people in the state. Under this scheme, the unemployed youth of the state will get some monthly allowances until they get the job. This scheme was specially implemented to offer some relaxation for the unemployed youth. With this scheme, nearly 12 lakh unemployed youth in the state will be benefited. The Government of Andhra Pradesh has introduced the AP Nirudyoga Bhruti scheme to offer some support for the unemployed youth. The youth will get the monthly allowance of Rs 1500 for the registered aspirants. So, the youth of AP wishing to know more details about AP Unemployed allowance scheme, how to apply? how much the government offers and other details from the following. ఈ నెల నుంచే రూ. 2 వేల బృతి. ఏడు జిల్లాలో శాసనమండలి ఎన్నికల కోడ్ అమలులో ఉన్నందున మీ నిరుద్యోగ భృతి పెంపు విషయం ఎన్నికలసంఘం పరిశీలనలో ఉన్నది. ఈ కారణం చేత మీకు పూర్వం వలె రూ 1000/- చెల్లింపబడుచున్నది. ఎన్నికల సంఘం ఆమోదించిన తదుపరి మీకు కూడా పెంచిన భృతి నెలకు రూ 2000/ – చొప్పున (ఫిబ్రవరి నెల నుండి) చెల్లింపబడును. 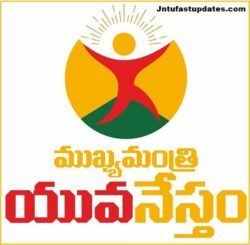 AP Yuva Nestham scheme / Unemployment Allowance scheme 2019 Application form (registration form) will be visible on homepage; click on it. The applicants will get the confirmation message to the given mobnile number. Documents required to register for “Mukhyamantri Yuvanestham / Unemployment Allowance scheme 2019” are Aadhaar, Ration card, SSC, Graduation certificates. ప్రభుత్వ, ప్రైవేట్ సంస్థల్లో పని చేస్తూ ప్రావిడెంట్ ఫండ్ (PF) ప్రతి నెలా చెల్లిసున్న వారంతా నిరుద్యోగ భృతికి అనర్హులు. వివిధ సంక్షేమ పథకాల కింద ప్రభుత్వం తరపున రూ. 50 వేలకు మించి సబ్సిడీ తీసుకున్న వారంతా నిరుద్యోగ భృతికి అనర్హులు. Movable/Immovable properties,having 4 Wheelers are ineligible. Having wet land of 2.5 acres and dry land of 5.00 acres maximum are eligible. Those who have availed financial assistance/loan under any state/central government sponsered self-employment scheme are not eligible. Applicant should not be employee dismissed from government service. The applicant should not have been convicted of any criminal offence. Once registered as an employee with UAN Number it cannot be removed under any circumstances. Now, the Nirudyoga Bhruthi registration is under progress in the state of AP. In this process, many of the applicants are unable to regiter with the nirudyoga bhruti scheme, due to their PF accounts have been listed in the database though they terminated their jobs. So, the unemployed people are unable to avail the nirudyoga bhruti benifits due to UAN number. Hence, the people who are registered as employees may not get the chance to avail the AP unemployment aid due to the unremovable accounts. 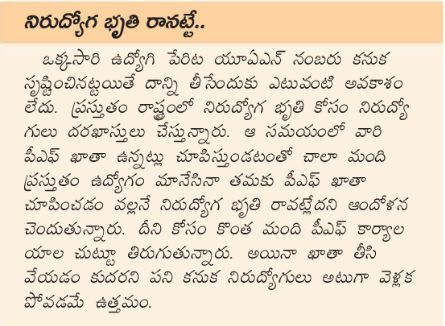 Candidates must make a note of this issue and proceed further with AP Nirudyoga Bhruti scheme. Why OTP not received ? Please make sure your current mobile no is updated with Aadhaar Portal. Otherwise, approach nearest Aadhaar Enrollment Center / UIDAI Portal/ Meeseva center to update your mobile number. Please approach Nearest Aadhaar Enrollment Center / Mee Seva Center to know the status and for updation. Please Click here to know the aadhaar enrollment centers. How much time it would take to reflect my phone no in Aadhaar if I updated today? How do I know that my mobile no updated status in Aadhaar? In case of mobile no update, status will be updated through SMS to the given mobile no by UIDAI. You can check the status at https://www.uidai.gov.in. Amount of allowance per month and whether it is uniform to all ie, Degree/P.G/Diploma Polytechnic etc.,? It is felt that there must be no negative signals conveyed through this scheme to discourage pursuit of higher learning and there should be a cooling period of 1-2 years after completion graduation. Hence, age has been considered from 22nd years upwards. Whether only one candidate is eligible from one family? All the candidates who are eligible from one family will be considered and given the assistance. Whether the candidate is eligible if his parents/family members are getting social pension? what is criteria for deciding the family annual income? White ration card will be taken into consideration. Besides that, those who are having 4 wheelers are ineligible. Having wet land of 2.5 acres and dry land of 5,00 acres maximum is eligible. In respect of Anantapuram District the limit is maximum wet land will be 5.00 acres and dry land will be 10.00 acres. Whether any registration in any Employment Exchange is required? All the candidates have to enroll their names in the app/web portal being prepared exclusively for the purpose. 15 to 21 days of time will be given for enrolment. Are those pursing formal education eligible or not? Is there any preference for differently-AIM for persons In the scheme? Is there any preference for SC/ST? Are the youth who have availed loans under self-employment programmes of different corporations are eligible? Whether the candidate dismissed from government service is eligible? Whether the candidate convicted of any criminal offence is eligible? No; He/She should not have been convicted of any criminal offence. Whether the unemployed youth of other states can be considered? No, the candidate should be native of Andhra Pradesh. Whether undergoing training/skill upgradation is compulsory? Whether allowance is given along with apprenticeship/internship? The Government of Andhra Pradesh has introduced the AP Yuva Naandi scheme/Unemployment Allowance scheme 2018. To support and mitigate hardship faced by educated unemployed youth in the state our Chief Minister Sri Nara Chandrababu Naidu garu started this scheme. The scheme is designed to upgrade skills of educated unemployed youth to make them employable and competent and cope with the expectations of industry. Similarly, to enable them to become entrepreneurs. This scheme surely could lessen the burden on unemployed youth and help them find a job at the earliest. This scheme will financially help the youth to get skill training for better chances of getting a job. During the application process, the candidates can fill their interested skills to get the training. The eligible candidates will get Rs 2000 every month from the government. The government offering the helping hands to more than 10 lakh people in the state. Minister Nara Lokesh said that, under Nirudhyoga Bhruti benefit scheme, the unemployed youth will get Rs 2000 per month. Minister Lokesh has also said that, if more than one person eligible to get this benefit in a family, this unemployment benefit will be offered for all eligible candidates. On August 3rd or 4th week, the Mukhyamantri Yuvanestam online registration process will be starting. The AP Government will open the registration for 15 to 20 days. During the application process, the unemployed youth of AP can enroll. The beneficiaries of this scheme will be from various districts such as Krishna, Guntur, East Godavari, West Godavari, Visakhapatnam, Srikakulam, Vizianagaram, Nellore, Prakasam, Kadapa, Kurnool, Chittoor, and Anantapur districts will be benefited from this scheme. The scheme will be started after 15 days (approximately) of the registration process. The Government of AP will also provide the training for the registered aspirants and appoint as the apprentice in various organizations. As per the public survey, more than 12 lakh hopefuls are unemployed in the state of AP. While the Government of AP is slated to release various notifications for, State Council for Physiotherapists, the establishment of the Air Strip in Kuppam, the new Hand Memorial scheme for the vacancies, Visakha Med Tech Zone, the recruitment of 20 thousand vacancies in the state and 9,000 teachers posts. Under the AP Unemployment benefit scheme, the Government of Andhra Pradesh To allot more than Rs 11 crore. Huda was named as Metro Regional Development Authority. The Huda range has been increased to 5573 sq km with 6764.59 square meters. The Government will offer the allowance to everyone as many people who have completed the graduate degree/diploma courses. Under this Nirudhyoga Bhruti scheme, the recipients will get Rs 2000 every month from the government. AP State Government will soon initiate a special website to receive the applications. As per the Survey, the Government is getting ready to offer the helping hands to more than 10 lakh people in the state. The beneficiaries of this scheme will be from various districts such as Krishna, Guntur, East Godavari, West Godavari, Visakhapatnam, Srikakulam, Vizianagaram, Nellore, Prakasam, Kadapa, Kurnool, Chittoor and Anantapur districts will be benefited from this scheme. The Government of AP striving hard to implement this scheme soon. To implement this scheme, the Government is spending a large amount of Rs 1200 Cr per year. AP Minister Lokesh has affirmed that the Government of AP has done the groundwork to implement this scheme smoothly. To offer the unemployment allowances to more than 10 lakh people, the Government will have to spend Rs 1200 Cr per year (approximately). The Government is planning to implement this scheme in coming month with accurate arrangements. While applying the process,i uploaded graduation pc and it shows image uploaded sucessfully…after that the certificate was not uploading and showing.it always showing error at certificate column.and no conformation about application is recieving.please resolve this issue. MY NAME IS PADMAJA .I JOINED THIS SCHEME IN JANUARY .I GOT MONEY FOR ONE MONTH. AND I CLOSED MY ACCOUNT IN FEB.AND STARTED THE NEW ONE .BUT THE MONEY IS CREDITED IN OLD BANK ACCOUNT ONLY .PLEASE MONEY SHOULD CREDIT IN NEW BANK ACCOUNT AS SOON AS POSSIBLE .I LINK MY AADHAAR TO NEW BANK ACCOUNT AND I CONFORM MY NPCI ALSO.SO PLZZZZ UPDATE AND CREDIT MONEY IN NEW ACCOUNT. I completed my Engineering Graduation in 2015 &I don't know how to apply for Unemployment allowance in AP as I'm Unemployed. Sir scheme ki last date epudu….ipudu apply cheyocha…?? ?